Did not receive what was advertised on website with regards to purchasing more expensive Club Losail Grandstand tickets over general grandstand tickets. No access to VIP area, no allocated seating, no complimentary food and drink! Paid £70.00 extra per ticket for very little benefit. This a must for MotoGP fans. We have been to quite a few MotoGP's around the world, and this has to be one of the most best. It is a so relaxed, well organised events. You also get to see so much with the paddock access and VIP tick, more than you get in Europe. European rounds are so expensive for what you get compared to Qatar. What a great race to be the first! Overall, it was a great experience. I was expecting it to be a lot more crowded, but Friday and Saturday were both VERY empty and Sunday was crowded, but not as bad as I immagined. Bring extra water, the food venues were great with lots of choices. The day time practices were shorts weather, but as soon as the sun goes down in March, it gets cold! Bring a light jacket and wear pants! The suggestion for the comfortable shoes is also a must. Everything about this venue and this race was amazing, if you have the ability and the means, it is a MUST for any Moto GP fan to see racing under the lights in Losail. After the race, the ability to go on the track and watch the podium and pit lane was probably the highlight, it is also a must for any passionate fan! Amazing experience! Great atmosphere, circuit is easy to access, possibility of free paddock tours, camel rides... The only thing I wish there was more of it - merchandising shops! Advice for the people planning to visit Qatar GP: Make sure you bring some jacket, it can be very windy and cold, especially in the evening. The event is not well attended but the atmosphere was still great. There is one huge covered grandstand on a first come basis with views over the pit straight and the paddocks, with 3 large TV screens, fab views, not much in way of entertainment and tents to eat but in my view enough for the amount of visitors. Taxi to the track from the Sheraton was £12 and there were loads of taxi's outside when the race finished. However we did leave as soon as the race was finished as the interviews weren't aired on speakers which was a shame so we decided to beat the rush back instead and watch that bit on TV. Thoroughly enjoyed it. Wish we were given a chance to meet our favorite riders. Bigger led screens would’ve been much appreciated as well. What a great start to the season! There is no better motor sport in the world than MotoGP!! We were expecting the atmosphere to be a bit subdued from all previous reports but it was like a carnival in the main grandstand by the time Moto 2 was in progress. The only let down, the off track facilities, asides from a few camels and things for kids it would have made a very poor car boot sale! I truly hope that Qatar considers the whole experience for the non-VIP’s a little more seriously before next year and the World Cup! So much better than previous years and the competition is excellent. Riders and bikes all performing brilliantly. So happy to be there. No real atmosphere present inside the grand stand. Unfortunately the weather is out of your control but when there is no racing on and the children's zone is also closed there is nothing to keep an adult entertained let alone a child. Coming from Britain rain is always an issue and there is always a wet weather programme. At the very least they could of aloud people to visit the pits for an hour of 2 to keep people interested and to feel apart of the event. What a great weekend! Will definitely be making it a regular thing every year! Great circuit, just a pity that the races could only be viewed from the main grandstand. 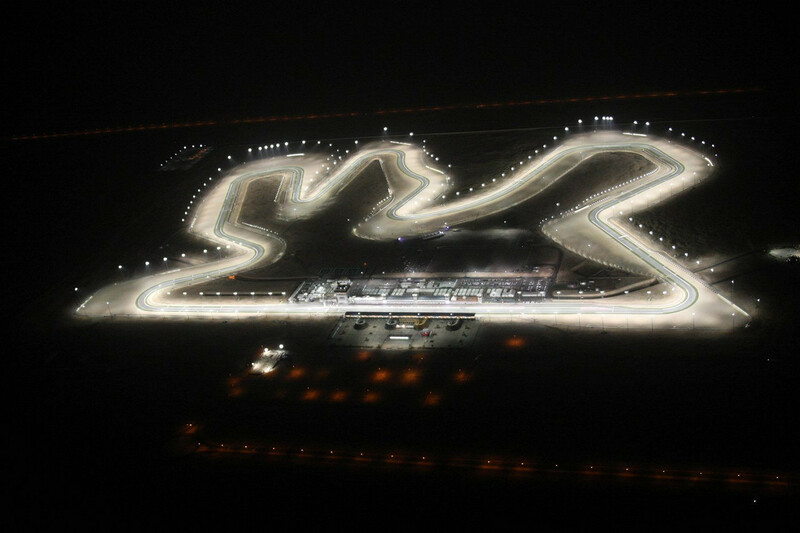 Obviously Moto GP is in its infancy in Qatar and will hopefully grow over the next few years. Facilities were limited but adequate for the numbers attending the race. We really enjoyed the weekend, but could have enjoyed the experience even more if the circuit was developed a bit more. This was my first visit to the Qatar Moto GP.Having read a few reviews beforehand I was a little apprehensive. OK there was not much happening other than the racing with only two small merchandise tents and a few food bars. However the food was fine and as its much smaller than other GPs ( by far) you don't have to queue long for food and drink. If you want your Rossi hats or Marquez T shirts then you can get them somewhere else. Having said that it would have been nice to have a memento from the circuit or even a programme. However where else can you get a ride on camel ? I liked the fact that you could sit anywhere you wanted and crowds were not huge and there was no need to get there really early to secure a good spot. Watching the race at night under floodlights was a bit special. Do remember that Qatar is basically a desert mostly surrounded by sea so expect cool to chilly evenings .So therefore pack a jumper,light jacket or fleece. I arranged a taxi from the hotel which cost me 70 rials each way (&pound;14) and getting to and from the circuit was really easy ( 30 to 40 minutes maximum from the city centre). Actually getting into and out of circuit was surprisingly easy. If you are collecting pre paid tickets just be aware its a about a kilometre or so from the pick up point to the grandstand entrance. So hang on to your taxi!